Austria's army will carry out thorough identity and bag checks on every migrant arriving at the main border crossing with Slovenia from Wednesday, as part of new government measures heralding a tougher stance in Europe's refugee crisis. 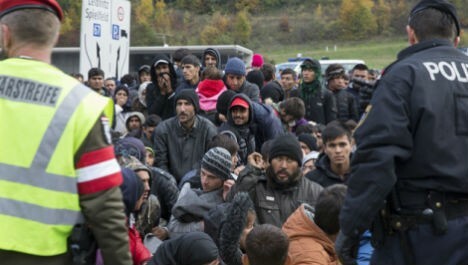 Some 500 newly deployed troops will assist police in processing up to 6,000 refugees and migrants on a daily basis at the Spielfeld crossing in the southern state of Styria, police spokesman Fritz Grundnig told AFP on Tuesday. In case of a spike in numbers, security forces could handle as many as 11,000 people -- roughly the average daily number of migrants who crossed into Austria late last year. "Until now we've only been able to carry out random spot checks but this will allow us to ensure watertight controls of every single migrant," Grundnig said. Initially the soldiers would only process "several hundred migrants" while the rest would be allowed to cross from Slovenia via Austria's other border crossing in Carinthia. "But the idea is that eventually Spielfeld will be the only crossing point for migrants," Grundnig added. The new measure comes just days before Austria is expected to complete the construction of a 3.7 kilometre mesh fence at Spielfeld. The barrier -- which could be ready by Friday, according to Grundnig -- will be the first of its kind inside the EU's passport-free Schengen zone. In a further sign of its hardening line, Austria has signalled that it would follow neighbouring Germany's lead and begin turning back any new arrivals seeking to claim asylum in Scandinavia. Berlin's clampdown started after Sweden and Denmark tightened their borders in early January. "If Germany rejects migrants who want to travel to Sweden, we will do the same," Austrian Chancellor Werner Faymann said on Sunday. Austria, a small nation of 8.5 million people, has become a key transit country for hundreds of thousands of migrants and refugees entering the European Union. Although most travel onwards, some 90,000 requested asylum in Austria in 2015. The influx has sparked tensions within the ruling centrist coalition between Faymann's Social Democrats (SPÖ) and the conservative ÖVP party. Although Faymann has noticeably sharpened his tone and called for "tougher controls" in recent weeks, he has so far resisted joining the ÖVP's demand to cap migrant numbers. The government will debate the situation at a national asylum summit on Wednesday.